Wrought iron balconies frame massive railway sleeper doors through which guests enter into this baronial hall. Chandeliers hang from exposed beams and a huge fireplace determines a character of understated elegance in a space that has been designed to host 60 guests or extend its functionality to accommodate 250 guests. The fire place, candle chandeliers, antique paint techniques and private enclosed courtyard create an intimate atmosphere ideally suited to smaller weddings. The venue can host up to 70 guests with a dance floor. The indoor chapel, is built out of stone, with exposed beams, wrought iron chandeliers and balconies and massive railway sleeper doors. 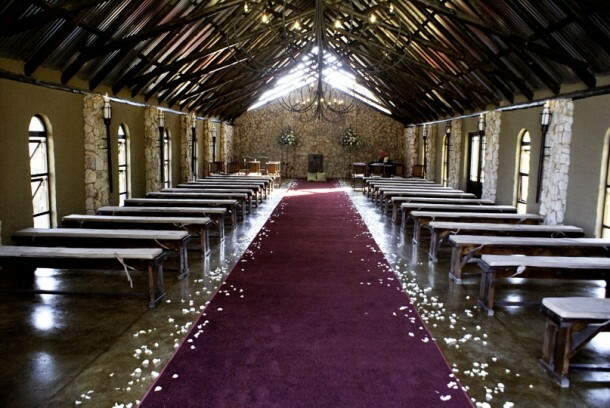 The chapel can seat up to 200 guests. The outdoor garden chapel nestles in between flowerbeds and has a gazebo, which we drape with meters of white chiffon to create a nostalgic picture of graceful elegance. Lush manicured gardens, with beds of seasonal flowers, makes this wedding venue in Gauteng an ideal spot for creating photographic memories. Water features and fountains, secluded benches and interesting archways create a variety of spectacular wedding photo opportunities. Tres Jolie offers the service of an experienced wedding co-coordinator to plan every detail of your wedding décor. If you are interested in this venue for your wedding contact Adele Pascal van Alphen on Telephone +27 (0)11 794-2473 or on her mobile: +27 (0)79 527-5008, or visit Tres Jolie for more info and photographs. Hi im very much interested in your wedding venue as i will be getting married in September 2013,the venue which im interested in is the The Fountain Court. Therefore could you please send me a qouatation for 200 guests. We’re so glad you like the venue! It would be best if contact the venue directly which you can do so in the contact details in the post above. Good luck with all the wedding planning!